The Alex and Ani Lotus Peace Petals bracelet is part of the precious threads collection. 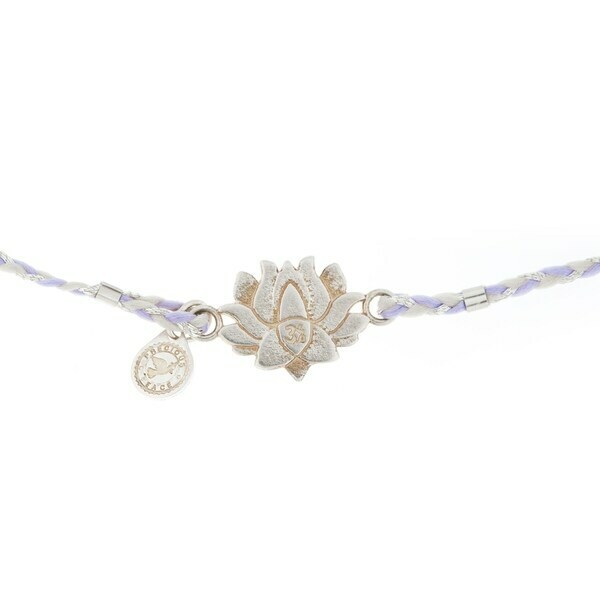 It consists of a sterling silver lotus flower charm on a braided purple and gray cord. The bracelet adjusts from 4 to 6 inches long. I purchased this bracelet for mothers day. It came a day earlier than expected which is great! although it did not come in an alex and ani box the white pouch pouch is good material and was able to keep the bracelet safe inside the bubble wrapped usps thing it camer in, the bracelet is thin and feminine but of good quality so its not going to break easily. I'm so excited to give the bracelet to my mom i knkow shes going to love it! The lotus petal was all silver, very thin. I like the Look of the pretty silver lotus but the bracelet it’s self is made of strain with silver thread and night totally natural. I was hoping for a thin silver link chain bracelet. this bracelet was just 'ok', not my favorite alex and ani piece, was kind of lightweight and not very substantial feeling. Will mix it with other a & a bracelets. Delicate & beautiful! I love that this can be dressed up or down... good for any occasion!